← Black-bottom Peanut Butter Cookies! 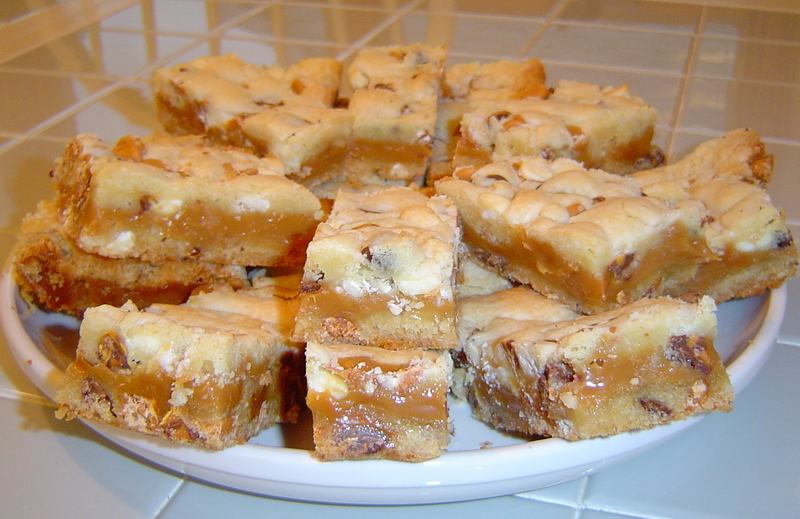 These chewy cookie bars are packed with 4 types of chips and a thick layer of soft caramel- YUM!!! Preheat oven to 350 degrees. Grease a 9x13pan. Combine cake mix, oil and eggs. Blend well and stir in all of the chips (mixture will be very thick). Press half of the mixture into bottom of pan (it will press into a very thin layer). Bake for 10 minutes. While this is baking, in a medium saucepan, combine butter, caramels and condensed milk. Cook over low/medium heat until melted and smooth (stir constantly!) Spread caramel over partially baked cake mixture. Top with remaining cake/chip mixture (it will not completely cover, but you can press the mixture flat with your fingers and lay it in sections over the caramel. Bake and additional 25 to 30 minutes. Cool 20 minutes. Run knife around edges. Cool completely before cutting. Makes about 20 bars. Posted in Bar cookies, Easy recipes and tagged bar cookies, butterscotch, cake mix, caramel, chocolate, cookies, dessert, milk chocolate, sweet, white chocolate. Bookmark the permalink. Those look amazing. I never have margarine on hand, so will use butter. But wow, can’t see any other thing to change.